Earthly planets you have found. I now have 72 planets! 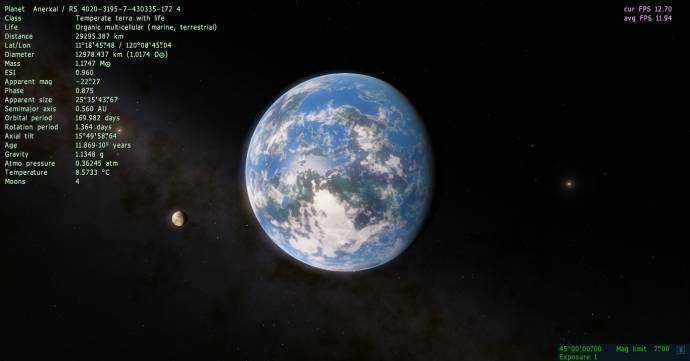 Note: This planet probably doesn't exist in your universe, I use a very different config from default and i'm not sure if this world appears on default. It is a very cloudy, white and blue world that you probably could initially mistake for a oceania. You can also see its desert moon, which no doubt affects the tides of the world. I named it Bahhatpala, after a indian astronomer and commentator. 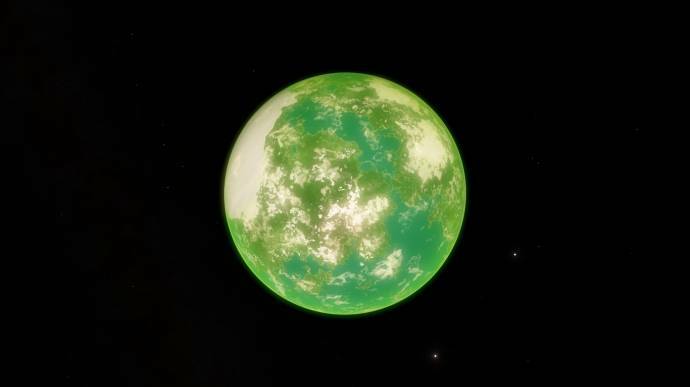 This moon has a strange anomaly- there is lava fissures in a couple parts of the world. I pinned this on the world having a very thin, but very geologically active crust. I wrote quite a bit more on Utpala itself. 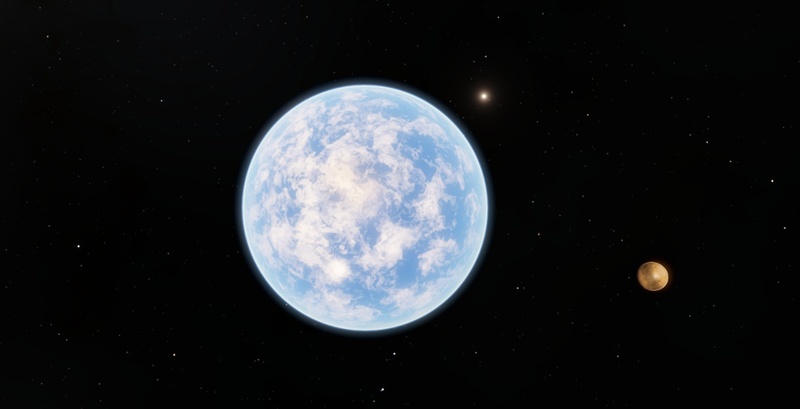 "Utpala is the closest «terra» known to sol, at a somewhat distant 16.5 light years from earth. 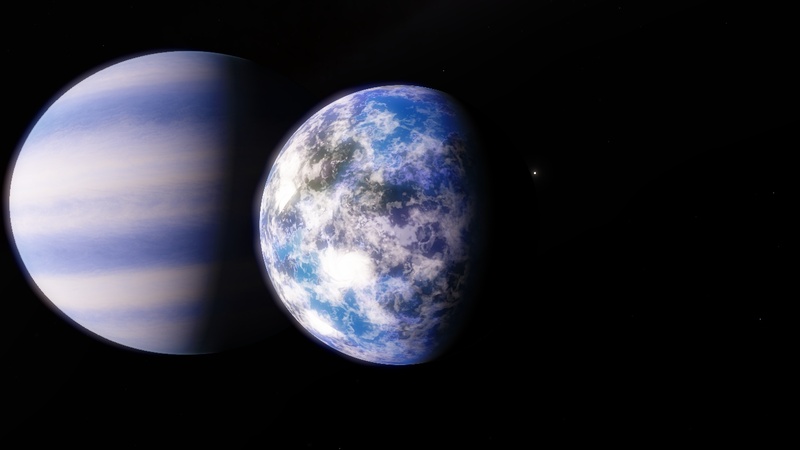 While closer worlds with life exist, such as the icy moon Jotenheim in Tau Ceti, this is the first world discovered to have a biodiversity that is comparable to Earth, even if said biodiversity remains a order of magnitude lower. Utpala is a world with a breathable atmosphere, but unlike earth it is the animals that produce oxygen when they exhale. This means that keeping the animals on frosty Utpalpa in close proximity is crucial, as it is these animals that act as a de facto and mutual oxygen source as they inhale carbon dioxide. Days on Utpala are 6 hours shorter and the gravity of Utpala is significantly lower, making the world quite easy to walk around and prance about in the snow. Named after the blue lotus of which symbolizes purity, Utpalpa is a winter wonderland with a breathable (enough) atmosphere, snowy landscapes and deep blue waters. while it is much colder than earth (-40 degrees celcius is the norm) it still became a major target of interstellar colonization in the year 2163. The world is very wet, with very large world spanning oceans and tidal cycles that are no less intense than on earth of which the plant life in the lowlands exploit heavily for their nutrition. The coastal areas host a treasure trove of fascinating creatures and ecosystems and are where biodiversity is the highest on the planet, despite the prescence of life in even the coldest of areas. Sea life on this world developed different that on earth, having developed to be large and almost serpentine as oppossed to making use of fins to any major extent. These sea creatures are like highly developed versions of flat worms, being able to easily survive being sliced apart and often feeding on each other or even themselves when desperate. Other sea creatures developed in ways like pyrosoma, except with higher levels of collective intelligence and much more complex means of interacting with the world around them. Life on the land makes heavy use of chilla and blubbery fat. Wyvern-like fliers dominate the skies of this world and often nest in caves in the frozen wastes far away from any other speices. These large fliers are able to thrive thanks to the lower gravities of the planet. The most iconic life on this world however, would have to be the Mole Yeti. The mole yeti are major predators that fill a niche akin to a bear. Not only are they heavily coated in chilla, but also have a large, fleshy trunk. The plant life of the world are dark, bulby and hairy plants of which are edible by human colonists, but they tend to have effects similiar to anti-depressants when eaten. Life on the world is notably asocial in comparison to earth, being highly territorial and usually omnivorus or carnivorus with some exceptions for coast-specialized life that dwell on the dark plants. The Sledders are perhaps the strangest life on this planet, with no equivelant niche to earth. They are large, flappy beings that use their 'wings' to walk, run and glide around the environment, along with 'sledding' around colder landscapes or to gain alttude. Unlike most of the creatures, they seem to come in packs though are far from collectively minded as evidenced by their constant internal competition. They are often prey animals for the wyverns, though they tend to opertuinistically feed on the Nymphoids and other small, insectesque creatures (Nymphoids have a exoskeleton, but are like flying crabs to humans) who make up the bottom of the food chain of the planet. Utpalan humans have over time become very adapted to the frigid conditions of the world over the centuries, and there is massive urban center on the Kidney island (it's that tiny, isolated island) with peripheral cities on the coasts of Caerulea (the large continent). The world exports large amounts of drinkable water and is a popular testing ground of cooltech suits and synthetics. While the world lacks in biodiversity in comparison to lusher worlds, the mega fauna of the world (especially the Moleyeti and Wyvern clades of life) have been spread to many out-system worlds since their discovery. Utpala is considered one of the major colonies of the Federal Association of Human Interests as of 2705 and despite brief occupation by the Varkiff, remains a firmly human majority world despite the noticable minority of Yalilu migrants." beautiful! you can give the code RS for pandora? I will be adding more planets to the count, but less frequently.